RazorSQL 7.0, an SQL editor, database query tool, database browser, and database administration tool, is now available. 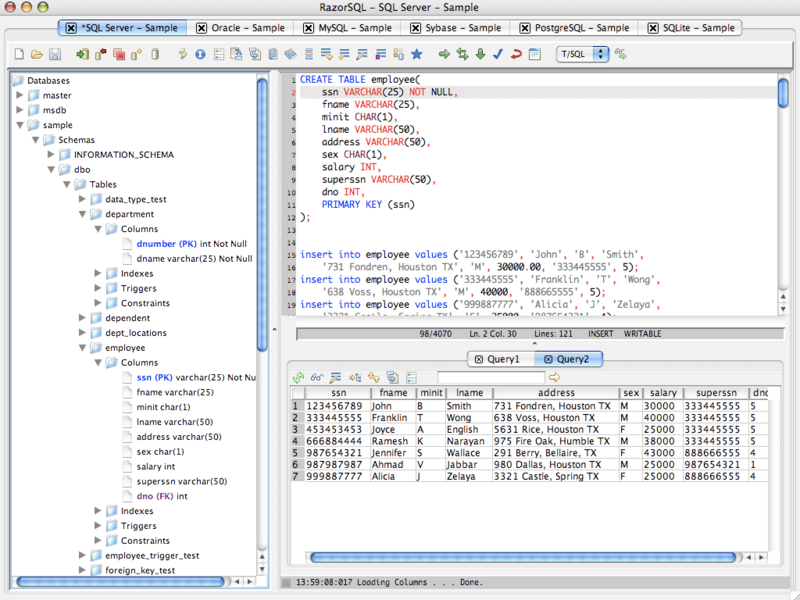 Using RazorSQL, users can query, edit, browse, and manage all major databases from one tool. RazorSQL supports over 30 databases, examples of which include the following: PostgreSQL, Amazon SimpleDB, Apache Derby, DB2, Firebird, FrontBase, H2, HSQLDB, Informix, Intersystems Cache, JavaDB, MS Access, MySQL, OpenBase, Oracle, Pervasive, SQLite, SQL Azure, SQL Server, Sybase, Sybase SQL Anywhere and Teradata. Connect to other databases via JDBC or ODBC (Windows only). Users can also use the built in relational database engine for their database needs. New features in version 7.0 include database conversion support for converting DB2 database tables to PostgreSQL and several other database types, more support for the Amazon Redshift database, and enhanced DDL generation options. RazorSQL 7.0 is available for immediate download at http://www.razorsql.com. Pricing of RazorSQL starts at $99.95 USD for a single user, and tiered discounts are offered for multiple license purchases.